There comes a time when your sprinkler timer seems to kick the bucket. If it's one with a dial, the sensors on those seem to go screwy after a decade or so. The buttons on other become rusted or difficult to press or just quit working altogether. Sometimes the screen malfunctions and the digits begin to fade. 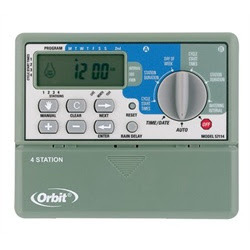 Some times you get lucky with an Orbit Timer that lasts your entire lifetime but if you are on the market for a new sprinkler watering controller, here are some things to keep in mind. Chances are, you're going to hit up your local Home Depot and look at their selection of sprinkler controllers and timers. You will be faced with a few different choices. One quick way to narrow it down is to decide on a brand. "Considering how much landscaping costs, there's little reason to scrimp on timers. I learned this the hard way, coming home from vacation to find my yard brown and parched. This timer, which was less than a year old had failed, and as a result, so did my grass. I'm now in the market for a new one that actually works." "The controller itself is solid and is a snap to install and set-up. The software and timepod are a great concept but suffer form horrible execution. By themselves, I would give them 1 star. They are supposed to be releasing new software shortly (the current software is copyrighted 2004), which will hopefully address the stability and feature issues." "I've used Orbit in the past and have controllers that have lasted many years. I've purchased multiple high-end, much more expensive Rainbird units that never had lasted more than 2 years." 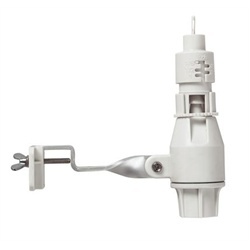 If you live in an area that gets a lot of rain, you could save yourself a lot of money if you go with a sprinkler timer that is compatible with a rain sensor or that has one built in. Rain sensors allow for the timer to be able to tell if it has rained recently. If it has, it will not tell the sprinklers to turn on because the lawn is already wet. This is an awesome feature that a lot of people are impressed by. While you're at it, look for a rain/freeze sensor combo so your sprinklers know to shut off in freezing temperatures! If you don't have a huge lawn or are not equipped with an underground sprinkler system you can always go with a Hose Faucet Watering system. Orbit makes timers that make hose watering a breeze. Afraid you're going to forget to turn off the hose? Problem solved! 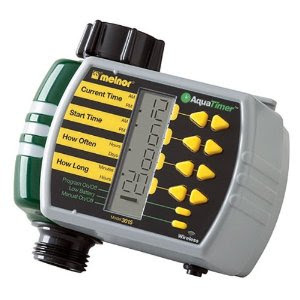 "This is the best water timer we have ever had! It is so simple to program and one can easily make changes. We love it!" "I water the horses 4 times a day. The Orbit One-Dial Water Time takes care of that for me now! It frees up my time for other chores. It was easy to set up and easy to override if I need to. I love it!" Before you settle on a timer, make sure you've done your research. There are hundreds of options and even more reviews at your disposal.